Not to be confused with Alexandre O'Neill. 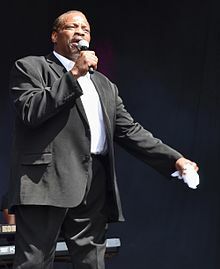 Alexander O'Neal (born November 15, 1953) is an American R&B singer, songwriter and arranger from Natchez, Mississippi. In a music career spanning more than 40 years, O'Neal is an accomplished R&B and soul singer. O'Neal came to prominence in the middle of the 1980s as a solo artist, releasing fourteen singles that entered the Top 40 charts in the US during the 1980s and 1990s. His solo singles, sometimes dealing with lost love include "If You Were Here Tonight", "Fake", "Criticize", "The Lovers", "(What Can I Say) To Make You Love Me", "The Christmas Song", "All True Man", "Love Makes No Sense" and "In the Middle". He is also known for duets with fellow R&B singer and Tabu labelmate Cherrelle such as "Saturday Love" and "Never Knew Love Like This". AllMusic has described O'Neal as having a "tough voice [that] has the same grain and range as that of Otis Redding." Alexander O'Neal was born November 15, 1953 in Natchez, Mississippi, a few months after his father was killed. After graduating from high school in Natchez, he attended Alcorn State University. At age 20, he relocated to Minneapolis, where he performed with several bands including the Mystics and Wynd Chymes. He became a member of Enterprise for a brief period before joining Flyte Tyme, a band which included Monte Moir, Jimmy Jam and Terry Lewis. O'Neal released his debut album, the eponymous Alexander O'Neal in 1985. Since then, he has released nine studio albums, six compilation albums and two live albums. In 1981 O'Neal was signed by Prince to the Warner Bros. label and the band name was changed to The Time. Following a disagreement with Prince, O'Neal left the band and was replaced as lead singer by Morris Day. O'Neal subsequently formed an R&B band called Alexander and recorded a couple 12" singles, "Do You Dare/Playroom" and "Attitude" for a Chicago area independent label, based in Merrillville, Indiana, called Erect Records. In 1984 O'Neal signed a deal with Clarence Avant's Tabu Records. He did some backing vocals for other artists on the same label, including The S.O.S. Band and Cherrelle. In 1985 O'Neal released his self-titled debut album under the production of Jimmy Jam and Terry Lewis. It included three singles that reached the Top 20 of the R&B Singles Chart. The same year, he also scored his first R&B Top 10 single with "Saturday Love", a duet with Cherrelle from her High Priority album. The song "Saturday Love" peaked at No. 2 and also reached the Top 10 of the UK Singles Chart, peaking at No. 6. In 1987 O'Neal released the album titled Hearsay, which yielded the No. 25 pop and the number-one R&B single "Fake". The song also peaked at No. 7 on the Billboard dance chart. The follow-up single, "Criticize", peaked at No. 4 on the R&B chart and No. 70 on the pop chart. The third single, "Never Knew Love Like This", another duet with Cherrelle, peaked at No. 2 on the R&B chart and No. 28 on the pop chart. By this time, O'Neal was enjoying greater success in the UK than he was in his native US. Hearsay peaked at No. 4 on the UK Albums Chart, eventually certifying as triple platinum, and spawning seven charting singles. The highest of these, "Criticize", peaked at No. 4 on the UK Singles Chart. "Fake" became a UK Top 40 hit twice, first in 1987 followed by a remix ("Fake '88") in 1988. The "Hit Mix" (a megamix of O'Neal's greatest hits to date) reached the UK Top 20 in December 1989. O'Neal also recorded a Christmas album, My Gift to You, which was released in December 1988. In 1991, O'Neal released his fourth album, All True Man. The album's title-track reached No. 5 on the R&B chart and No. 45 on the pop chart. The album was another success in the UK, peaking at No. 2, though sales did not reach the levels of his previous album. In 1992, his first greatest hits album, This Thing Called Love: The Greatest Hits of Alexander O'Neal, became another Top 5 success in the UK. In 1993, O'Neal's final album with the Tabu label, Love Makes No Sense, was released. This was the first album made without production from Jam and Lewis. Although it reached the UK Top 20 and two singles from the album reached the UK Top 40, sales were not as strong as his earlier releases. After leaving Tabu O'Neal signed for Motown but no singles or albums were released. In 1995, another greatest hits compilation, The Best of Alexander O'Neal, was released. A year later the compilation was re-released with three tracks from O'Neal's short period with Motown added. In 1996, his first album with One World Records, Lovers Again, was released. The album did not chart in the UK, though the single "Let's Get Together" reached the UK Top 40. In 2001, he released an album on Eagle Records, Saga of a Married Man. The album was produced by former Prince drummer, Bobby Z. In 2005, he recorded his first live album, Alexander O'Neal Live at Hammersmith Apollo, featuring songs from throughout his career. In 2008, O'Neal released Alex Loves..., his first studio album in six years. The album peaked at No. 49 in the UK, and was his first charting album of new material in 15 years. In 2014, O'Neal signed a new management deal with Howard Perl Management (Beverly Hills), which awarded him extensive tours and a cast member on Celebrity Big Brother. In June 2016, O'Neal collaborated with Manchester-based funk band, Mamma Freedom, on the single, "Fake", a re-recording of his 1987 single of the same name. The single was released shortly before O'Neal embarked upon a UK tour, with Mamma Freedom providing support. In 2017, O'Neal collaborated with Manchester-based funk band Mamma Freedom on the album "Hearsay30", a re-recording of his 1987 album. The album was released on 1 December 2017. In 2006 O'Neal appeared on the Weakest Link, All Singing All Dancing Edition, where he was the 5th contestant voted off the show. In 2006 and 2007, O'Neal participated on the British reality singing contest show Just the Two of Us. In 2008 O'Neal took part in a Wife Swap UK special, swapping his wife Cynthia with broadcaster and TV personality Jilly Goolden. The programme included an in-depth interview with O'Neal by noted UK R&B writer Pete Lewis of the award-winning magazine Blues & Soul. The interview was featured in full in the August 2008 issue of the magazine. In 2011 the TV One series Unsung profiled O'Neal's rise to fame, along with the story of Cherrelle. In 2015 O'Neal took part in the Channel 5 reality series Celebrity Big Brother. On Day 12 O'Neal decided to leave the show. ^ a b Ebony Man: EM. 6. Johnson Publishing Company, Incorporated. November 1990. p. 72. UP-FRONT Alexander O'Neal the All True Man Returns in much the same fashion that legendary Motown singer Marvin Gaye ... Upon finishing high school in Natchez, he attended predominantly Black Alcorn State University in Lorman, Mississippi, before moving to . [...] In 1984, he inked a contract with Tabu/Epic Records, and the rest, as they say, is history. ^ a b Adam White; Fred Bronson (1993). The Billboard Book of Number One Rhythm & Blues Hits. Billboard Books. p. 393. ISBN 978-0-8230-8285-8. O'Neal was born in Natchez, Mississippi, but moved to Minneapolis when he was 20. He joined a ... After being replaced as lead vocalist by Morris Day, he formed a rock and roll band called Alexander. [...] O'Neal spent a short time in a group called Enterprise before being recruited into Flyte Tyme, a band that included Jam and Lewis as well as Monte Moir. ^ Nielsen Business Media, Inc. (22 February 2003). Billboard. Nielsen Business Media, Inc. p. 30. ISSN 0006-2510. ^ "Alexander O'Neal at SoulTracks". Retrieved 2018-03-04. ^ "The Best of Alexander O'Neal releases at Discogs". Retrieved 2018-03-04. ^ Pete Lewis (August 2008). "ALEXANDER O`NEAL: Life swap!". bluesandsoul.com. ^ Douglas, William (3 June 2011). "TV series puts 'Unsung' black music stars back in the spotlight". Archived from the original on 2 April 2015. Retrieved 3 March 2015. ^ "Day 12: Alexander leaves the Celebrity Big Brother House". channel5.com. Retrieved 2015-01-23.